For anyone who hasn't seen this. 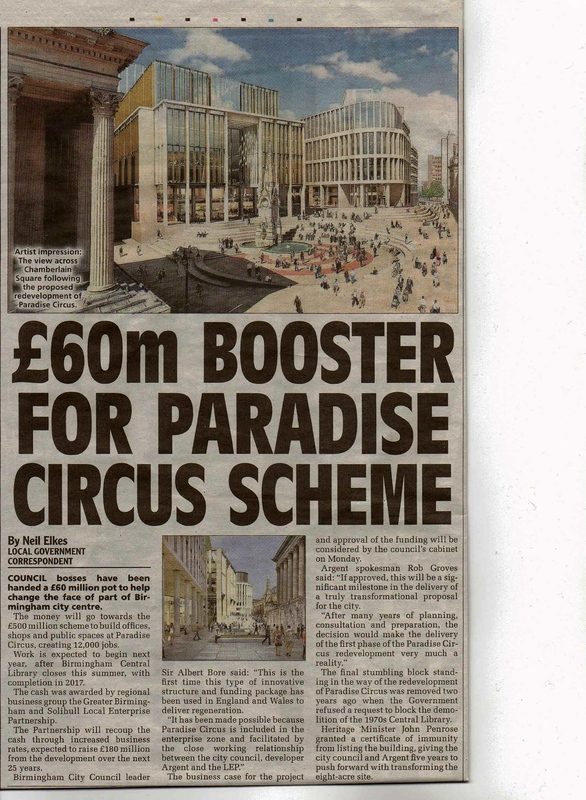 A Birmingham Mail article on the proposed Paradise Circus Development, for when the old library complex is demolished. Oh Goody, we are going to get a big ugly concrete monster. Wether anyone likes the design or not is up to the individual. As far as I know there has been no public consultaion, as far as I am concerned it is far too big for r the site (echoes of the bloody library). Why oh why would anybody think that another concrete monstrosity to replace the one that stands in a square that has Victorian buildings on all the other three sides. Given the opportunity to rectify things they come up with this? By the way isn't this still Chamberlain Square and not Paradise Circus? Paradise Circus doesn't really exist does it? I thought it came about as a general name when they built across all the roads that were there first. At the moment it's Chamberlain square. The walkway through the Present Library building is called Paradise Forum. That's where the new name of Paradise circus come from. I suppose this is Birmingham City Councils way of ridding the square of the Chamberlain name, possibly because of the links with Neville Chamberlain, but in reality the square has little to do with him and is all about his father Joseph. Anyway I have always thought that Neville was much maligned after all he only tried to do what he thought was best for this country and it's people and he had no wish for us to get involved in another world war. It's a pity we can't seem to nurture more politicians of his sensibilities today. it seems to be a trait of successive Brum Councils to get rid of traces of history in Brum.